You are at:Home»Crypto News»EOS price analysis: EOS/USD back below $14.00 as ten big whales are swimming in EOS sea. EOS price analysis: EOS/USD back below $14.00 as ten big whales are swimming in EOS sea. EOS stays below $14.00 as MainNet launch hype is over. Market is speculating that half of EOS tokens controlled by 10 addresses. EOS/USD is changing hands at $13.80, down 11% since the peak reached on June 2 in the aftermath of EOS mainnet launch. The project finished its year-long ICO, raising over 42,000 ETH. Now EOS system is supposed to be decentralized and operated by the community, but latest research data shows that 50% of tokens belong to 10 addresses, which creates favorable conditions for price manipulations. Block.one, the company behind EOS, holds 100M tokens, which is about 10% of the total issuance. The other 9 addresses are hard to identify, but the largest holds 380M tokens and the smallest have 20.M tokens. It means that they can influence the market, especially if they agree to pool their interests. The research is based on analysis of six independent snapshots of EOS ownership. 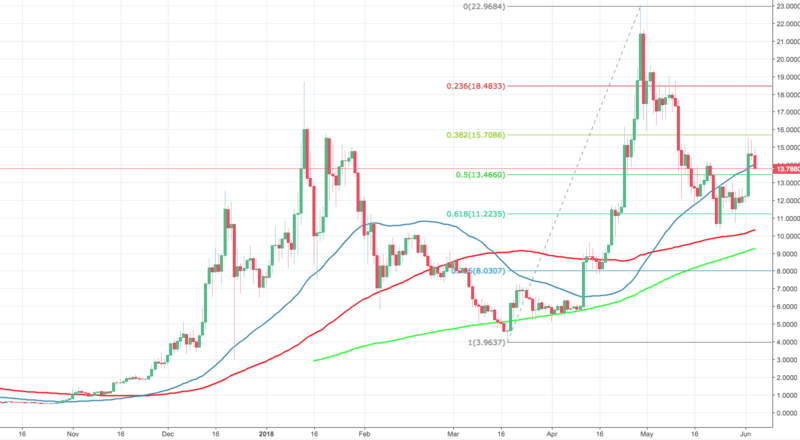 EOS/USD is supported by $13.46 (50$ Fibo), followed by $12.00 (June 2 low), once this level is broken, the focus will shift onto $10.85, which is the lowest level since May 24. The critical support is created by $10.00 with 100-DMA at $10.40. The recovery is limited by $14.00 (50-DMA), followed by $15.50 and $15.70 (38.2% Fibo).